First off, I received a complimentary copy of this book from Thomas Nelson through NetGalley. Opinions expressed in this review are completely my own. 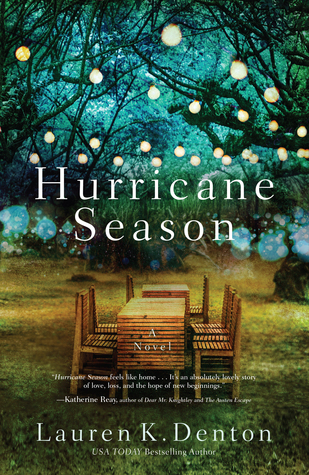 This week I read Hurricane Season by Lauren K. Denton. This was my first book and I can’t wait to read more by Denton. I would give this book a 3.5 out of 5. We meet two sisters, Betsy and Jenna. Betsy is the older sister and married to Ty. She wanted children, but unfortunately can’t have any. You have Jenna, the younger sister. She is single with two children. The opportunity comes for Jenna to live a dream. Taking the chance, she asks Betsy for favor. To watch her daughters, Addie and Walsh. Betsy, being the older sister agrees. Even though Ty doesn’t think it’s a good idea. He’s worried about Betsy. After all, they have never been able to have kids and it hit Betsy hard. Watching the kids, Betsy grows attached to them. Which of course would have to cause problems in her and Ty’s relationship. As this goes on, a hurricane is brewing. I’ll leave the rest for you to check it out. If you are looking for a book to read, maybe on Spring Break? I would definitely check this out if you are looking for a good book on family and love. Unfortunately, I couldn’t find a character I could relate to. I am the baby of the family of sisters. But, I don’t have daughters. Anything close to that, would be Gabby, my dog. I also live in a town, not a farm. Plus, I live where we could get tornadoes, not hurricanes. Either way though, I didn’t want to put the book down. Books like this are a good escape from my usual genre of books. I love my favorite genres, but every once in awhile. You need a good book to take you away that’s not elves, witches, etc. I would probably consider this one women’s fiction. I’m already debating if I should suggest this for book club next year. For faults? I couldn’t really find any. I would definitely say, check this one out.